Our certified SAP BusinessObjects training team can deliver courses and workshops at your business location or in one of our offices around the country. We also provide laptops with BusinessObjects training software installed, as well as training manuals and certifications to complete our cost-effective training package. A few of the companies that have recently benefited from Influential’s on-site training include Saunderson House, Axa Insurance, Victim Support, Croydon Council, Bield Housing and Care, and John Lewis. To survey the full range of options that Influential’s BusinessObjects training team has to offer, please visit www.business-objects-training.co.uk. Your business needs training delivered in the right way, so you can unlock the real potential of the software you have purchased and maximise user adoption. Whether it is SAP BusinessObjects, data warehousing, generic Business Intelligence and data warehouse, or generic BI and data visualisation training, we can offer a style tailored to any level of your enterprise. Bearing in mind that people learn in different ways – with some preferring aural, visual, or kinaesthetic – differing groups respond more effectively to varying training methods. At influential, by making you part of our Training Needs Analysis process, we can help you make the all-important “delivery style” decision. 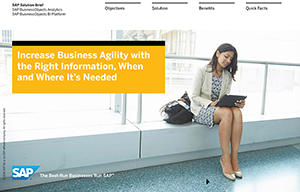 Get an overview of some of the benefits of SAP BusinessObjects BI Platform by downloading the SAP Solution Brief.